Manage Access functionality provides a system to ensure that each individual user in your instance can quickly get the resources they need. Access can be restricted when necessary, and you can share certain resources publicly with view-only access with non-Kapost users. Managing multiple teams in Kapost is often necessary in order to coordinate the various moving parts of programs and integrated campaigns. While this is great for alignment, it can get messy quickly. Specify individuals as owners: Owners are the users who can delete an item and can decide who else on the team can manage access to it. Only owners can transfer ownership to other users. Specify individuals or groups who can edit or view: Members with edit access can create, update, and save changes. Members with view access will only be able to view. Automatically notify groups and individual team members when you grant access. Share private or public links: A public link allows you to share information with non-Kapost members. Lock: Private, only the owner can grant access to others. Group: Owner and other members of an instance have access. Building: Accessible to all members of an instance. Globe: A public link is available to share with non-Kapost users (only applicable in Canvas Plans and Calendar Views). Keep plans and charts private until you're ready to communicate them with your team. Create catalog and calendar views that track content that's specific to a team or business unit, and make sure those views don't clutter the space of other teams or business units who don't need to see that work. Create private, customized task views for yourself of only your tasks or the tasks of a team you manage. Organize agency or third parties into groups in order to control what they can access with minimal clicks. You'll see the manage access icon throughout your Kapost instance. Click on it to manage the access for the specific task you're working on (like a plan in Canvas). When you click on the Manage Access icon, a pop-up modal will appear in which you can see and choose who to give access to as well as what level it should be. You can select individuals, any groups that have been configured, or all the members who have access to a certain application in your instance. View access will be given by default, so change the drop-down to the pencil icon to grant edit access. Note: Only the owner can update access unless they have unchecked the setting to prevent members with editing privileges from updating access. In that case, users with edit access can update access for others. Also from within the modal, you can copy a link or embed code to share with users. Remember to click Update to save your changes. Note: If you choose to reassign all of a user’s work to another user from the member’s page, their access will be reassigned as well. As nice as it is to be aware of what other teams have going on to coordinate and repurpose content, it can also get messy when different teams all have their own specific Saved Views. Saved Views in Studio allows you to quickly and easily cut through all the content, initiatives, and calendar options that exist in Kapost to find just what you care about without having to search or filter each time you navigate to those pages. You can create a Saved View and choose to share it only with certain team members or groups. And you can decide to grant access to view, edit, or own a particular Saved View. Like your Saved Views in Studio, you can create a Calendar Saved View and choose to share it only with other team members or groups. Calendar Saved Views can be made public and shared with non-Kapost users when that level of visibility is required. You can choose to grant access to view, edit, or own a particular saved view. Learn about calendar filters and creating views here. With manage access in Canvas, you'll be able to specify which individual team members or groups should own, edit, or view plans and their associated charts (access from the plan level is inherited by the charts within in). You can also share a dynamic view of any plan or chart with non-Kapost users to better align all stakeholders. When you're working in Canvas, find the Manage Access icon in the top righthand corner to open the pop-up modal. Here, you can control team members' access to plans you own: assign ownership, define the members and groups who can view with no editing capabilities, or edit plans. Edit access grants the ability to add or remove charts, update chart configuration, and upload plan attachments. Saved Boards enables you to create charts to analyze the performance of your content operation and use these insights to improve future strategy. Once you begin building your saved boards and have added charts to them, you'll have the ability to manage the access of your boards. These cannot be made public to non-Kapost users. As soon as you create a board within Saved Boards, you'll arrive at a page where you can begin editing your board and adding charts. Find the manage access icon in the upper righthand corner, or from the edit view in the More drop-down menu. Once you click on Manage Access, the pop-up modal will appear that will let you choose which other Kapost users or groups can access your board and what level of access they should have. *Bundling Content is currently in beta. Please reach out to your Kapost CSM if you would like to use and provide feedback on this feature. Bundling Content (or Bundles) enables you to curate and share small groups of content in your Gallery with your key internal stakeholders as well as with external prospects. You'll find the Manage Access feature from within a Bundle by clicking on the More drop-down menu. You'll also find the Manage Access icon for Bundles when you're viewing a Bundle in the upper righthand corner of the page. Use the pop-up modal to enter in the information to share the Bundle internally or externally. Once you make a Bundle public, you can copy the public link from anywhere. Creating a public link means that anyone with the link can access the Bundle. For example, if you copy a Bundle's public link and send it to someone via email, they'll be able to click that link to access the Bundle. This method of sharing Bundles provides anonymous metrics for Bundles shared with and viewed by an external party, meaning you can know that Anonymous Person looked at Demo Bundle three times and looked at Content Asset 1 and Content Asset 3. If in the External Access tab in the modal you enter a specific email address, the Bundle will only be accessible to the email addresses specified. In order for a non-logged-in user to access a Bundle that has specified email addresses, they must enter in a specified email to gain access to the Bundle. When you share a Bundle with a person specified via an email address, such as JaneDoe@Kapost.com, you'll have metrics available to see when Jane looks at the Bundle and what pieces of content she's looking at the most. When you share a Bundle externally with logged-in users or non-Kapost users, they will be able to see the Bundle, click into its content to view it, and see a menu on the righthand side of the content to quickly navigate through the remaining content in the Bundle. The content details for content being accessed through a Bundle appear differently than what users see when they access it through a Collection. 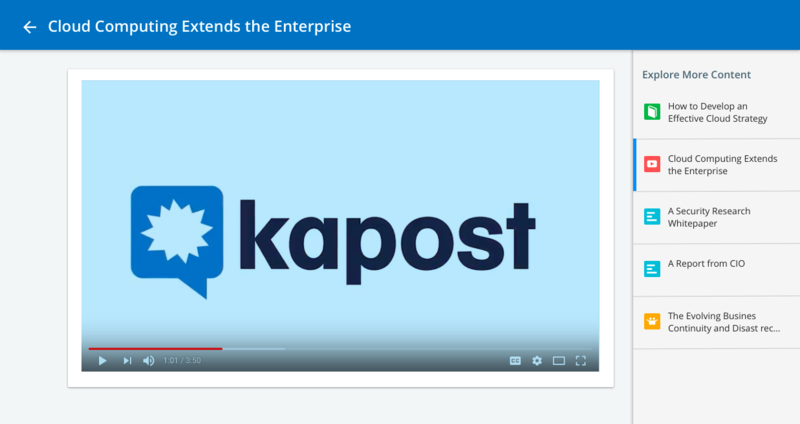 If you're not logged in to Kapost, you can see more information on a piece of content by going through a Collection than by accessing the content through a Bundle as a logged-in user. This view is streamlined to make it optimally enjoyable for a prospect viewer.